Big improvements have recently been made to the main Park entrance off West Road which should make it safer and easier to use for people with all kinds of wheels. The path through the Park to Fox Covert Lane has also been improved and widened. To mark this step forward the Mayor and Lady Mayoress came to cut the tape and celebrate with us. 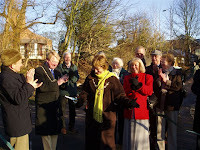 The picture shows Lady Mayoress, Sylvia Proudlock, cutting the tape surrounded by councillors and Friends of the Park.